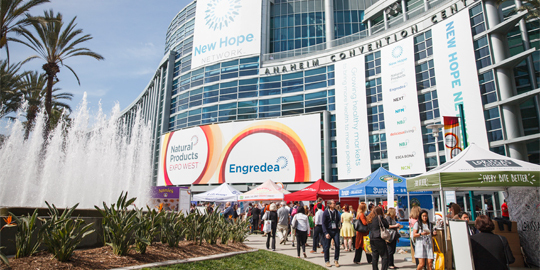 The Natural Products Expo West keeps getting bigger. More than 3600 companies were showcased this March in Anaheim, California and an estimated 90,000 attended the event. Two of them, IPA’s George Paraskevakos and Elisa Fernandez travelled to the sunny clime to meet up with members and scope out probiotic innovations. They were not disappointed. The convention center offered everything from natural foods, supplements, and ingredients to home and beauty products, all in the “clean” category. And no surprise, the microbiome is never out of style. Prebiotics are gaining more traction as well as products incorporating probiotics outside the usual food and beverage categories. Probiotic cleaner with an amazing name– Counter Culture— lies well outside the normal offerings. Other patterns: less sugar, more healthy fats, more plant foods, and many forays into hemp and its variations. And sourcing, delivery systems and packaging are all areas of deserving product innovation. Read about the trends and discover some fresh new brands which earned the spotlight. See the online gallery at newhope.com. New Hope Network which hosted the colossal event asked influencers (social media stars with large followings) to pick their favorite trends this year. See the slideshow at New Hope Network site. In that vein, digital pro Lindsay Mauch of LTM Digital wrote about the brands at the show which successfully leveraged social media to market their products. Mauch also included creative tips on reaching influencers and bloggers. And finally, don’t miss a special video from New Hope filmed at the Expo. Fun appeared to be in good supply.